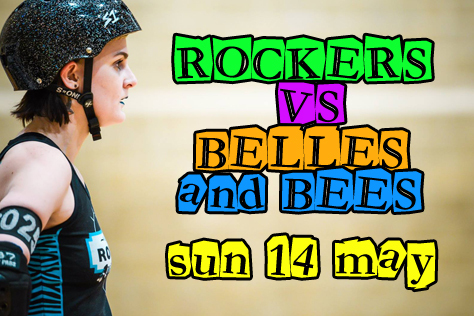 ROCKERS vs BELLES and BEES – Looking Ahead To This Sunday’s Derby Action! The mighty Brighton Rockers are back in action in Haywards Heath this Sunday (14th May). The A-team recovered from their heavy loss at home to Vienna in March, thumping Portsmouth away a few weeks later to get back most of the ranking points they’d shed since the start of the year. They will be taking on the Hell’s Belles from Hertfordshire at 2.35pm on Sunday, with the B-team Rockerbillies facing Suffolk Bees (the Suffolk Roller Derby B-team, obvs) at 4.55pm. Doors are at 2pm and tickets are available online from the link at the bottom of this piece, priced £10 adults, £8 students, free for under 12s. There will be tickets available on the door, but the special 4-for-the-price-of-3 deal is online only. Skip these two paragraphs if you don’t like to know predictions ahead of a game. Having reclaimed most of their lost ranking, the Rockers A-team currently place 99th in Europe on 554.4 points. Hell’s Belles are not far behind in 102nd (553.9 points). FTS give Brighton 56% chance of victory here, with a 13:12 predicted differential suggesting something like a 195-180 home win. Switch to the UKRDA ranking system – which doesn’t factor in Brighton’s recent big losses to European sides – and the Rockers (24th) are given a whopping 86% chance of beating the Belles (38th). Predicted differential here is 29:16 which is a 232-128 type victory margin. Don’t forget to pick up your free copy of our magazine Turn Left on the door – this one’s a special issue in which we talk to twenty former Rockers stars!